Don't you just want to dive into this picture and play? I'm loving everything about it. These are some of the lovelies I received from Holly. I had such fun opening and unwrapping every morsel of this thoughtful gift! Thank you thank you thank you, Holly! 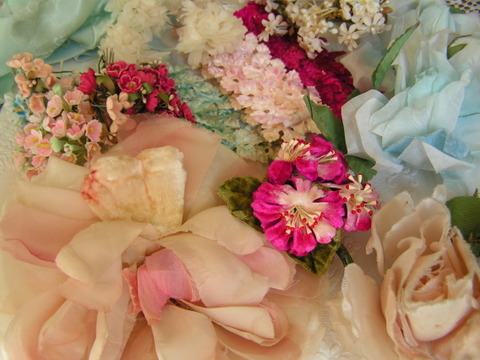 Fabulous vintage millinery flowers to swoon over. Pictures just don't do them justice. I told her I want to tie them all on a ribbon to wear around my neck so they are always with me. I know. I have issues! 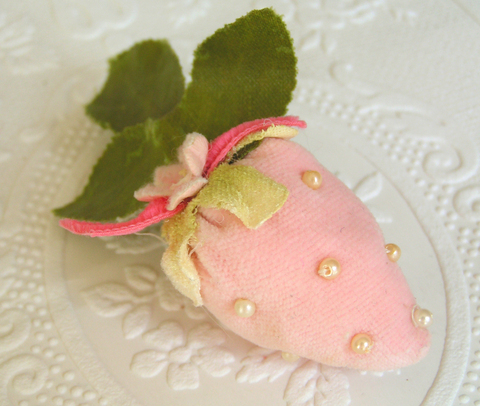 A handmade velvet strawberry to cherish. Of course I will. I love it. 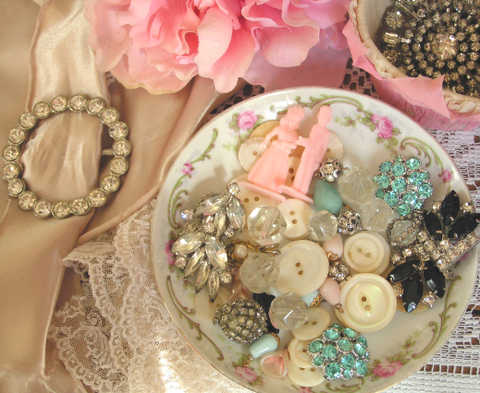 Vintage baubles to sparkle, shine and embellish. Buckle = True Love. Do you see those blue buttons? They will go on the inspiration board for sure! 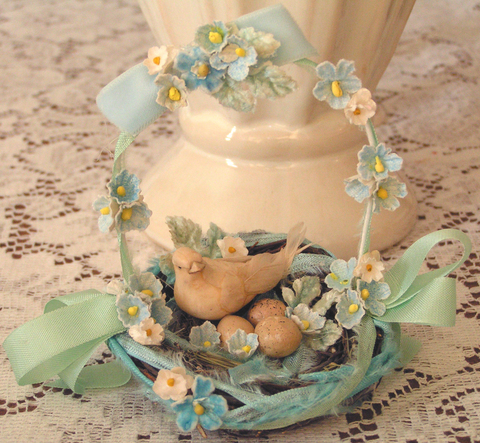 One of her sweet Nest Baskets to display in my studio space. Handmade gifts are always special. Whenever I get one, I can picture in my mind's eye, the artist sitting at her table carefully putting each element into place. It's easy to tell when someone takes care and time in creating art. Holly certainly does. Some of the prettiest wallpaper I've seen. Let me tell ya, it's not easy to unroll paper that's been rolled up for a half a century! Hopefully you can tell by this peek how fabulous these patterns are. 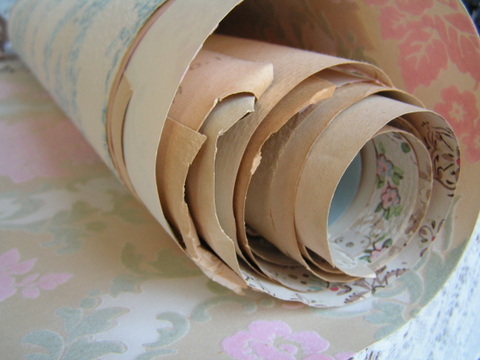 I love this image with the tattered edges and shades of beige and pastels on the papers. 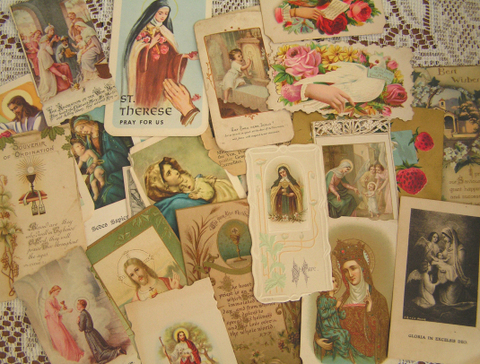 Vintage religious cards to add to my collection. Such sweet and dear-to-my-heart images. She also painted a very special piece for Sam's nursery. 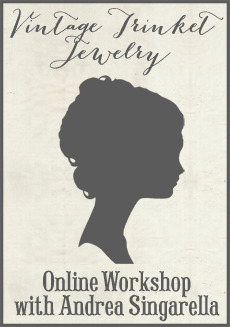 Did you know she is an amazing painter and takes custom orders? I think I'll save the painting for another post. I've been wanting to post about Sam's little room, so I will show you all of the baby things at once. Very thoughtful and very beautiful. Something to cherish, for sure. I just thought you should know that I love to peak at your blog daily. You have so many dreamy treasures that you share, I love it! Yes, I do want to dive into that pile of lovelyness and play. Everything is just beautiful. 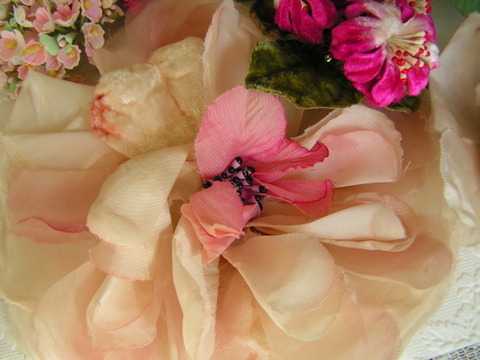 Ohhh what beautiful trinkets and these great millinery flowers and leaves.You´re a lucky girl!!! But i have seen the beautiful basket you have send her and its also gorgeous!!!! What a wonderful gift! You are very lucky that you can actually dive into that picture and play. WOW!! What a beautiful package from Holly!! Oh, you lucky girl!! Look at all that yummy goodness!! I love it all!! Especially the flowers and the blue buttons- oh and the wallpaper!! It's all beautiful Andrea!! You are a lucky girl! Enjoy all of your beautiful fun things. How could I have missed so many of your posts. 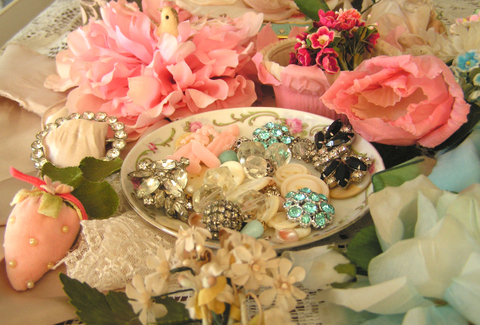 I am swooning over your millinery flowers and jewels. Oh, the lovely things you will create. Those photos are all drool-worthy! But that little sewn strawberry is just adorable! I'm absolutely drooling! Look at all the delightful glitz and glamour. I just don't know which way to look...it's all so gorgeous! you hit the jack pot! wow, again I am speechles at what you sent to each other. So wonderful to have a friend that understands your love for pretty things! Eye candy for as far as the eye can see. And zero calories!!! YEAH! Wow, you are very lucky! I can think of many things to do with all of those and I love the religious cards, those are so pretty! wow!! I love everything Holly sent!!! so fabulous!!! lucky you!! !